I am testing in a live system and looking at the very drive, from which it is booted, the current daily iso file of Lubuntu Xenial i386 (post 16.04.1 LTS). The problem is that the file system cannot be identified, and several end users may (and will) think that the USB boot drive is damaged. But it works, it is cloned, which is the straightforward method to create a boot drive from a hybrid iso file. this issue was worse in previous versions, where gparted would complain about an error; now it is at least seeing the partition. The next step is that it can see the file system too. The attached screenshot illustrates the problem, and shows that it affects the text mode program parted too. After some testing I found that the current i386 versions behave in a similar way as Xenial. But the current amd64 (64-bit) versions are more severely affected by this bug. It is much worse in Trusty, but also bad in Xenial as illustrated by screenshots in comments #6 and #7. 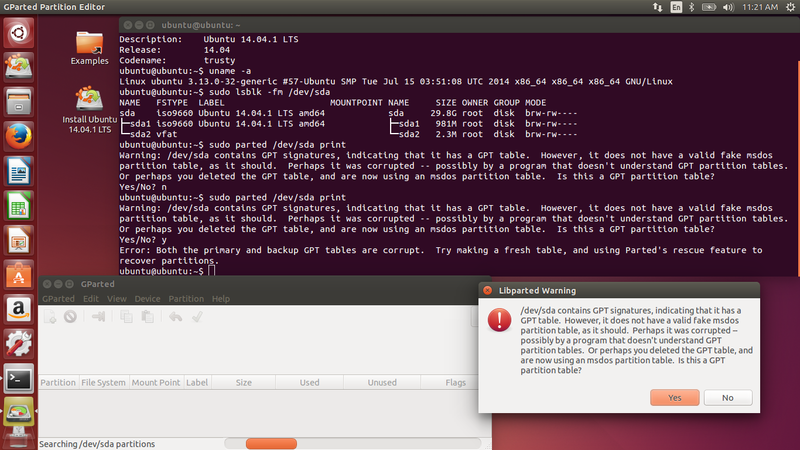 This behaviour will really confuse new users of Ubuntu and the Ubuntu flavours. Having found this problem with the Trusty amd64 version, I tried the Xenial amd64 version too, and it is affected in a minor way. It shows the file system, but it gets the sector size wrong and hence the aize of the drive. My 32 GB seems to contain 119 GiB (128 GiB is reported by parted, and it thinks it is a mac file system). The the screenshots in this and the following comment. Please, consider subscribing to the upstream bug report at (https://bugzilla.gnome.org/show_bug.cgi?id=771244). 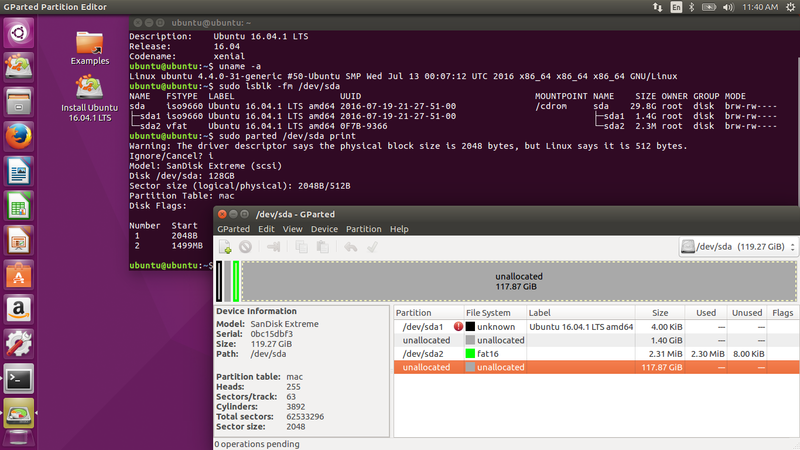 I am running Ubuntu 16.04.1 LTS, 64-bit. 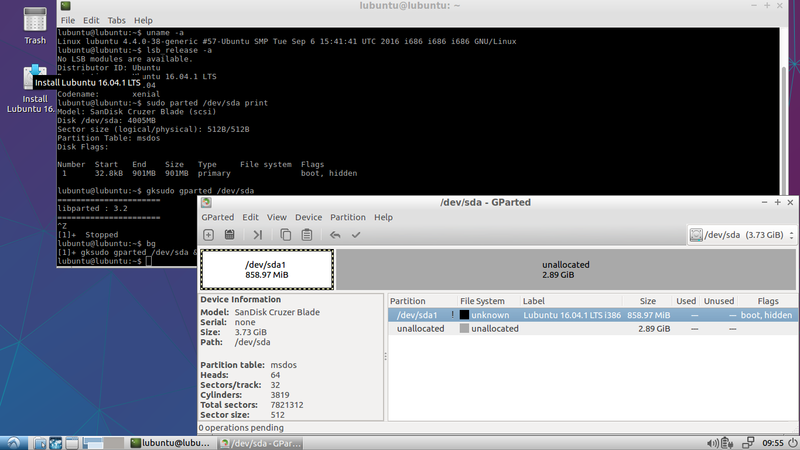 For some time I have been using Startup Disc Creator to create Lubuntu 32-bit install media (on USB flash drives). However, today (8th September 2016), when I was attempting to create a Lubuntu 16.04.1 LTS desktop 32-bit install USB flash drive using Startup Disc Creator (0.3.2), it would write the iso to the flash drive OK. Except for one thing. The flash drive is not being recognised. To quote GPartEd, "Unable to detect file system!". Bit more: Whilst the resulting install media can install Lubuntu OK, you just can't look at it with a File Manager or GPartEd. 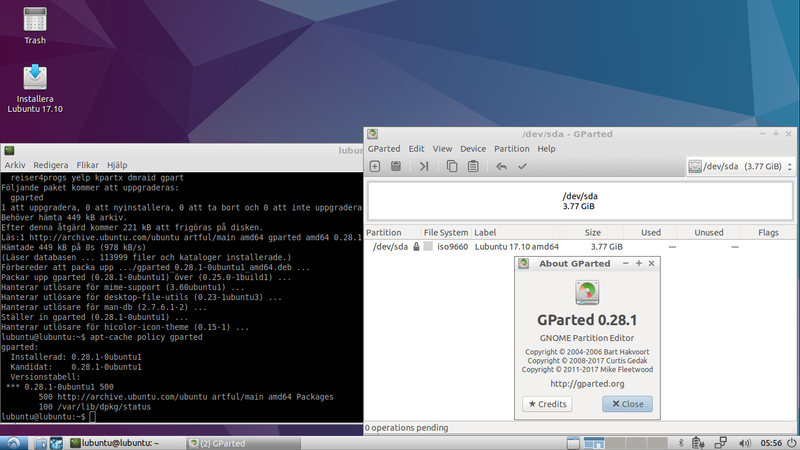 No, gparted does not work in this case (but in most other cases gparted is a good tool). lr-xr-xr-x 1 root root 1 sep 9 20:15 ubuntu -> . What I hope is that after this issue is resolved, it will be possible to use partitioneditor and make additional partitions on the stick - otherwise all the extra space is wasted. It's not easy to find USB3 sticks less than 16gb these days. It is important that gparted can read the typical file systems of [hybrid] iso files *cloned* to USB drives and memory card. One reason is that otherwise people will think that the file system is damaged, when it is actually exactly what it is supposed to be. 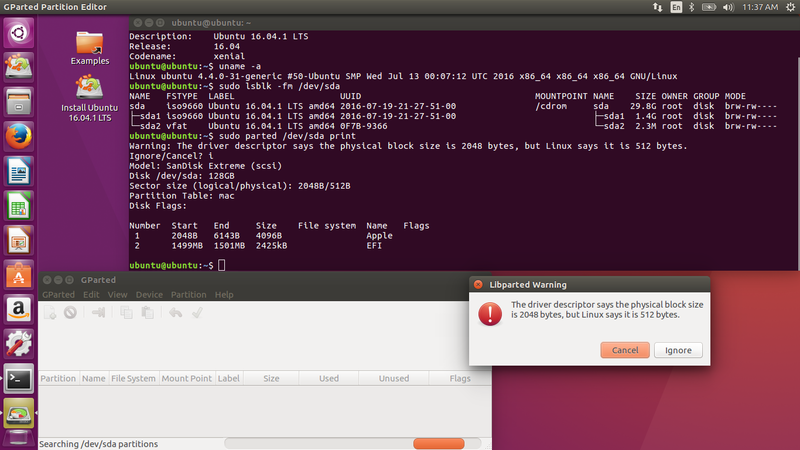 The *Ubuntu Startup Disk Creator* (alias usb-creator-gtk) in 16.04 LTS and newer versions is a cloning tool. *Disks* (alias gnome-disks) and *mkusb* (when making live-only boot drives are also cloning tools. But it will not be possible to edit the partition table and create a new partition after the partition(s) with iso 9660, because this whole partition table is read-only by its nature. It was designed for optical media (CD and DVD disks). So if you wish to use the extra space, you can should use a tool that *extracts* the content of the iso file to an already created file system. One alternative is a *persistent live drive with mkusb*, which uses a partition with the label 'casper-rw' and an ext file system for persistence and another partition with the label 'usbdata' and an NTFS file system for general storage and communication with computers running Windows. *Unetbootin* and *Rufus* are extracting tools also when creating live-only USB boot drives. Finally, mkusb can *restore* a cloned USB boot drive to a standard storage drive with an MSDOS partition table and a partition with a FAT32 file system. There has been problems (bugs) in Disks, but now I think it can also restore a cloned USB boot drive to a standard storage drive.